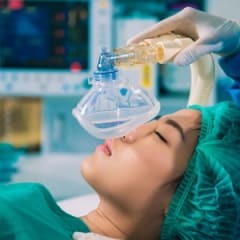 The average salary for an anesthesiologist in Texas is around $271,230 per year. This is 325% above the national average. ● Updated in 2016. Anesthesiologists earn an average yearly salary of $271,230. Wages typically start from $173,020. How much does an anesthesiologist make in Texas? How much does an Anesthesiologist earn? Anesthesiologists are some of the highest-paid physician specialists in medicine. Salaries can vary by sub-specialty, type of facility, geographical region, and number of years in practice. According to Salary.com, the median annual Physician - Anesthesiology salary is $352,518, as of February 22, 2016, with a range usually between $305,400 - $399,629. Anesthesiologists with a lot of experience can expect to earn upwards of $450,000. Many anesthesiologists also receive a bonus in addition to their salary, and anesthesiologists are paid a premium when working in specific areas, such as pediatrics or cardiology. Compensation typically includes salary, bonus, and profit-sharing contributions. For partners, compensation includes earnings after tax-deductible business expenses but before income tax. Compensation excludes non-patient-related activities (eg., speaking engagements, product sales, etc). Regardless of specialty, there is still a large pay gap between full-time male and female physicians. In anesthesiology, men earn approximately 16% more than women (overall, male physicians earn 30% more than their female counterparts). It is interesting to note, however, that there are fewer women in some of the higher-paying specialties, which skews the overall percentages. An anesthesiologist's salary varies significantly by region. Physicians in the North Central region, with the highest compensation earn 20% more than their colleagues in the West, with the lowest compensation. Why the high income in the North Central region? "There's less managed care, fewer doctors per capita, and a lower cost of doing business," says Tommy Bohannon, from Merritt Hawkins, physician-recruiting company based in Irving, Texas. How do anesthesiologist salaries compare to similar careers? Anesthesiologists earn 11% more than similar careers in Texas.